Peanut Butter Cup Pretzel Bites are a sweet and salty, indulgent dessert your whole family will love! The what you ask? Foodie Extravaganza is a group of bloggers who love to blog about food, each month we will decide on an all-famous National Monthly Food Holiday in which we will base our recipes around. This month the ingredient is pretzels with an optional ingredient of caramel. Yes, October is National Pretzel Month along with a whole array of other delightful things! Get excited! We hope you all enjoy our delicious pretzel treats this month and come back to see what we bring for you next month. So let’s talk pretzels… Do you love them as much as I do? Honestly they’re one of my favorite snacks. I like them plain – meaning unsalted, with a bit of salsa, dipped in cheese and of course loaded with chocolate and peanut butter flavors. There’s so much to love about these soft, little pretzel bites! Homemade pretzel bites are super easy to make and taste so much better than those frozen pretzels you can buy at the grocery store. My daughter loved “helping” make these, it was so fun for her to watch the process of how pretzels are made and then get to experience them once they cooled down a bit. I especially loved the look on her face when I pulled these golden beauties out of the oven, needless to say we were all a little impatient waiting for them to cool. Soft peanut butter pretzels bites are stuffed with miniature peanut butter cups and make the perfect decadent dessert or game day snack. They are definitely a little bit of heaven. If you’ve got a group of friends or family full of chocolate and peanut butter lovers like I do, then you need these in your life soon. Enjoy and happy baking! To the bowl of your stand mixer fitted with the bread hook attachment add the warm water, brown sugar, yeast and melted butter, stir and let sit 5 minutes for the yeast to bloom. Then add the peanut butter and salt and stir to combine. Add the flour and stir to combine, knead the dough on medium speed for 4-5. Oil a large mixing bowl and transfer the dough to it, turn to coat and cover with plastic wrap. Place the covered bowl in your oven with the light on and let rise 1 hour. Remove the dough from the oven and preheat to 425º F.
Line two baking pans with parchment or baking mats and set aside. Add the 3 qts of water to a large pot and bring to a boil, add the baking soda slowly so it doesn't boil over. In a small bowl whisk together the egg and 1 Tbs of water, set aside. Divide the dough into 4 equal pieces and roll them each into a 12" log. Cut each log of dough into 12 equal pieces. Flatten the pretzel dough and place a peanut butter cup in the center and then fold the dough around it pinching to seal. Repeat the stuffing process with all the dough. Working about a dozen at a time place the pretzel bites into the boiling water for 30 seconds. Remove from the water with a slotted spoon and place on the baking pans. Brush egg wash over the tops of the dough and sprinkle on a little sea salt. Bake for 15-16 minutes, until golden. Remove from the oven and let cool 5 minutes on the pan, serve warm. Store leftover pretzel bites in an air tight container for up to 3 days. Are you a blogger interested in joining our group? 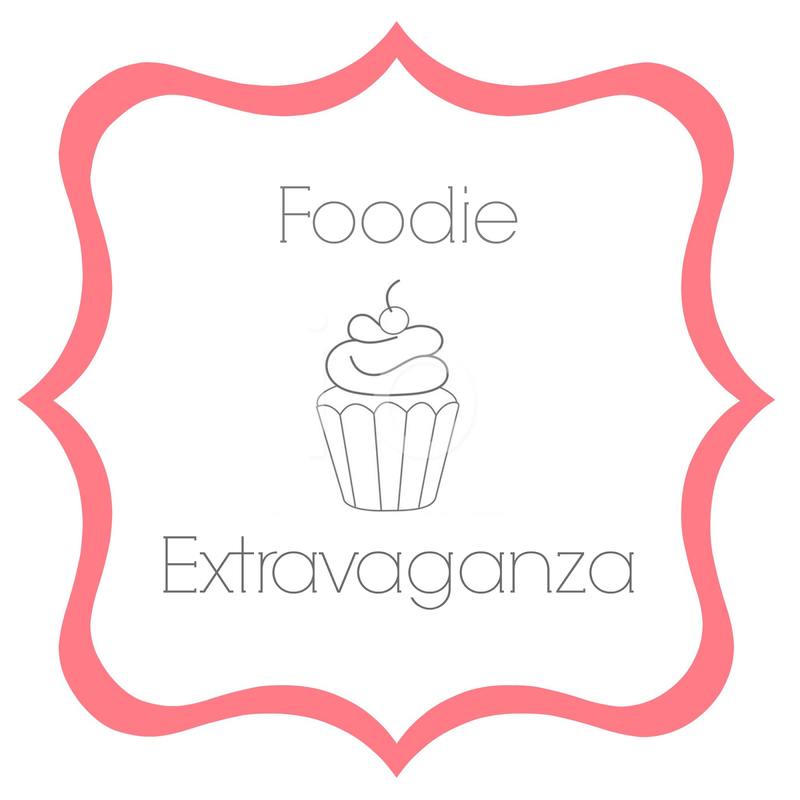 Come join our Facebook page Foodie Extravaganza, we would love to have you! If you’re a spectator looking for delicious tid-bits check out our Foodie Extravaganza Pinterest Board! Looking for our previous parties? Love these little pretzel bites with the surprise in the middle, Emily! thanks Stacy, they were a big hit with my family! I love pretzel bites, but stuffed with peanut butter cups is even better! I am drooling over these little bites! These are totally happening over here (yay for sales on Halloween candy right now…mini Reese’s!! )…they look so addictive. You got some gorgeous color on these babies! pretzels and reese’s ….you are now officially my hero!! I love dipping pretzels in peanut butter. I’m ready for a plate of these! I hope you can try them soon Cindy, they’re delicious. These look so good! I LOVE soft pretzels paired with anything sweet. Pinned! We already know chocolate and peanutbutter are a match made in heaven. Add the salty goodness of a pretzel and you’re out of this world good! I’m really more of a savory gal, but these have my vote! Oh, my. Nice job. How genius are these perfect little bites of heaven? I am a sucker for soft pretzels too and would not be able to resist a batch of these peanut butter cup ones. They look gorgeous!